... lives in the Twitter feed Preschool Gems. As the school year draws closer, take a look. "I have crazy stuff going on in my mind. I can dream about brownies even as I am eating them." Dark Tickle has been making jams and sauces for many years, but obviously the Northern Peninsula company couldn't possibly be a household name everywhere. Um, northwestern? St. Lunaire-Griquet begs to differ! Ferguson soon enough corrected himself. Fitness, skepticism, Justin Bieber and the Mayan apocalypse. All covered! A Twitter meme that passed by my eyes last night was called #junkfoodnovels - the challenge being to adjust the name of a book with a not-particularly-respectable food item. Thus, options include The Sound and the McFlurry, Lord of the Fries and Clan of the Gummi Bears. I chipped in my own .. not being able to resist this kind of a challenge. My best shot: Don Quixostess. 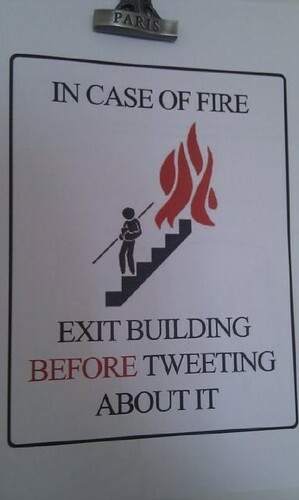 It may be risky to find the humour in earthquakes, but Twitter did it in a promotional video it released a few days ago. This shot has been making the rounds, and with good reason. Seen at The Next Web. One of the ongoing memes of digital culture that shows no sign of slowing down is the use of the style of Second World War-style propaganda posters, applied to very modern things and ideas. Here's the latest I've seen: a take on Twitter's fail whale. You can buy the poster here on Etsy. Mental Floss calls out OMGFacts. Ouch. This coming Wednesday, from 8 o'clock, a number of the people in the St. John's area who use Twitter will be getting together. It's a tweetup, sparked by Andrew Grothe. I'll be there. I know of some others, like Mark Critch, who plan to drop in. 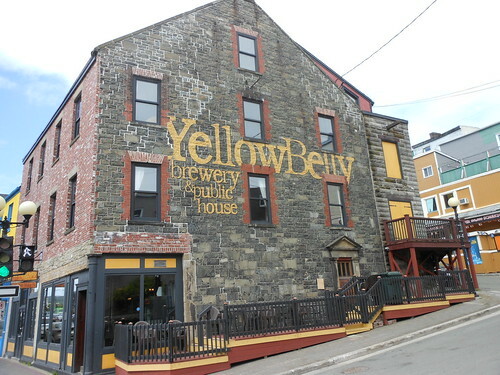 It's at the Yellow Belly, on Water Street. Hope to see you there. Most regular Twitter users have seen enough of the fail whale - the charming illustration that pops up to basically mask the fact that Twitter can't handle its traffic loads. Why, then, not serve up some cake for those idle moments? As seen here. The Christmas season kicked into gear this week at our house: the Santa parade downtown on Sunday, and on Tuesday, a multiple number of things: the opening of the advent calendar, a hectic but tasty Festive Special at Swiss Chalet (a true marker, for our family) and the first chapter of Kevin Major’s The House of Wooden Santas, an advent calendar in its own right, albeit in hardcover. Many of the social cues in our house are made by our nine-year-old son, who already has a list of things needed for a complete Christmas. I’m not sure if the weather will co-operate with one of them, but his snowman-in-a-box kit stands by at the ready. From a site called Why Christmas? comes this collection of explanations of many of the things – from pointsettias to pudding – that we find around us at this time of the year. Curious young minds (and, yep, the older ones) will learn plenty of things here. There’s more to be found, too: check out the navigation bar on top to see how Christmas is celebrated in dozens of countries, as well as some fun and games, such as a drag-and-drop way to virtually decorate a tree. The above link will tell you about Christmas in plenty of countries (including, to my surprise, China), while this one focuses at length on French customs and traditions, including a history of the Christmas tree that’s pretty detailed. The Woodland junior school in Kent, England, has earned a reputation worldwide for offering an annual online advent calendar that is as engaging as it is fun. Each day, a new fact about Christmas around the world will be unveiled, so bookmark it for repeat visits. I like online advent calendars so much, I started my own. Each day through the season, I’ll be writing about some of my favourite Christmas albums and songs. Check it out through the season, and send me your suggestions! You can make your own advent calendar, of course, with simple materials. I saw one online made with matchboxes and fabrics that looked surprisingly fancy. This one is appealing for families with busy kitchens: decorate (and sacrifice) a cookie sheet, and use metallic objects for the fun. You’ve missed a few days, but you can still have a blast with the kids. Lots of websites are adapting the advent calendar theme this year, as always; I’m going to be following this science-minded blog’s revelation of information (starting with an explanation of caffeine) through the month. Got a bag of red candies, some glue and a Styrofoam wreath? (Don’t worry: I have none of those things, either.) The decorating maniacs at the specialty channel HGTV have that and many other ideas for sprucing up the house, with step-by-step galleries to guide the way. A good sign that the Muppets still have a huge following? Their hilarious take on Queen’s Bohemian Rhapsody attracted eight million views on YouTube in its first week, largely through word of mouth. Gonzo & co. make the song family friendly, too, by having Animal handle (well, skip over by way of mangling) the more contentious lyrics, about Mama, a trigger and such. In other words, something even the youngest can enjoy, including Beaker’s high notes, and Sam the Eagle handling the line (“No, no, no, no, no!”) that in almost seems to have been written just for him. The evenings are dark now, but that hasn’t stopped our family from trying to get out when we can for a healthy walk. The first site on this week’s web tour is all about the St. John’s-area network that has transformed how many of us spend our leisure time. The Grand Concourse is an ambitious project launched by philanthropist Paul Johnson and his family’s foundation, and now includes a network of trails and guided walks that crisscross the city and into neighbouring municipalities. Many of the trails are old and well-established, but have been upgraded to terrific shape because of the Grand Concourse’s work. The website underwent a recent overhaul, and has plenty to offer, including suggestions on walks of varying skill levels and lengths, with complementing maps and photos. Among other things, it makes good use of mashups with Google Maps, so you can get a good idea of where a given route will take you. While it’s nice to see a more robust web presence, I’d suggest a few things. For instance, it would be terrific to be able print simple, clean sheets on each hike. As well, the organization could develop a greater sense of community by inviting participants to get involved, and using user-generated tools for photo-sharing, hike descriptions, etc. After all, the Grand Concourse, which holds not just one local gem but many, is all about public participation. Scribd is fast becoming a popular application all over the web, probably because it’s easy for users. It produces Flash-powered embeddable documents, which means that rather than linking to a PDF, you can put it right in your blog or website, and the reader can see scroll or tab through the whole thing. The document can be as a big as a book or as small as a brochure; that’s up to you. Better yet, it can be shared, which can help let your content move around the web, if you’re cool with that. It’s a handy way to bring something like a PowerPoint presentation to the individual level, as well. Heavy users range from major publishers, like technology gurus like O’Reilly Media, to small businesses. Photoshop Disasters made the news this fall when one of its routine posts – they all involve errors and distortions that somehow made their way to print – royally ticked off fashion company Ralph Lauren. The blog had merely pointed out that a particular model has sci-fi-style proportions, winding up with an impossibly skinny waist. When other sites, including the wonderful Boing Boing, raised hackles, Ralph Lauren went to its corner and had a boo-hoo. Fortunately, Photoshop Disasters is still plugging away, pointing out the sublime and ridiculous. Time magazine may never be able to shake its image as being stuffier than a starched shirt, but that hasn’t stopped it from running a political blog with plenty of bounce. Swampland is a collaborative project by the magazine’s writers, with frequently updated posts on each day’s political news, with an unsurprisingly hefty emphasis on Washington. (It’s not called Swampland for nothing.) I subscribe to the daily email alert, for reminders to check out new content. Because Twitter’s in-house search system only allows seven days of access, along comes Snapbird, which lets you comb through many weeks of tweets – as long as they were made by friends or those you’ve marked as favourites. A handy tool for locating something you read weeks or months ago. Imagine a robot world where the machines have been sleeping, for lack of a better, word, for 10,000 years. A lightning strike reanimates one of them, and in this charming little game, your job is to get everything back on the go, one step at a time. If you’re confounded, you can take a little cheat and click on Walkthrough … but I bet you’ll love figuring out as much as you can on your own.